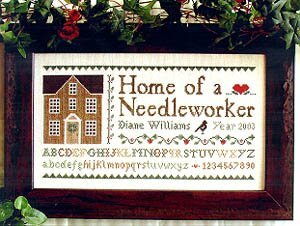 Decided yesterday afternoon to start stitching the original smaller-sized version of the Little House Needleworks chart “Home of a Needleworker”. I am working on 22-count Antique White Aida instead of the 16-count Natural Aida called for in the leaflet. 16-count would have worked up as a finished size of 12-1/8″ x 6-1/8″, and that seemed somehow far too large for the informality of the design. It’s a piece meant just for myself that includes personalization, so I thought that 22-count and an 8-3/4″ x 4-3/4″ finished size (before framing) would be more appropriate. That way I can hang it anywhere in my small house without it seeming too overwhelming. Lately I have been thinking about creating a “sampler wall” in my dining room. At the moment a quartet of woodcut-style prints hang in the small space I am considering using. An eclectic arrangement of samplers could fill the wall there nicely, and the old art prints would look just as well in the guest bedroom. Of course, this dream is a bit premature, as I am still working on several of the pieces that I want to eventually frame and hang! But it does give me a goal to aim for, and I like goals. The only hindrance I see is where to get the kind of frames I want. Most of my samplers lean towards the “primitive” look, and I would like to find a source for rustic-looking frames. Cost is a big issue for me these days. I know how to use a miter box so think that I could make my own frames if I could find a place for architectural salvage or somesuch. I just need a good source for distressed moldings.